Wireless Technology is becoming a key differentiator in the industries to enhance respective efficiencies and value propositions for plethora of operations. Wireless technology, complimented by Industry4.0 is rapidly replacing conventional cable-based networks due to reduction in costs and versatility in placing devices without any crucial requirement of creating a suitable infrastructure. Wireless devices operating in industrial locations are based on Radio Frequency (RF) spectrum utilized in variety of industrial operations such as asset management, logistics, process measurements, maintenance and installation of equipment. But the key issue with integration of wireless devices in process and discrete automation include induction of currents in metallic objects or inadequate EMI-protection for electronic circuits. These currents can become a notable source for generation of sparks if the wireless power level exceeds 2W under excessive temperature conditions. Therefore, the protection of such wireless devices with suitable means is a critical issue looming around the industrial ecosystem. The Explosion Proof Mobile Devices report is aimed at exploration of market for several wireless devices that could become a significant source of explosion under suitable conditions. These devices have been segregated into two chief categories: Computing and Communication Devices. The Computing Devices mainly utilized for measurement and monitoring purposes comprises of Smartphones, Laptops, Personal Digital Assistants (PDAs), Portable Cameras and Scanners while Communication Devices consists of supporting networking elements such as Antennas, Access Points, Radio, Headsets and Microphones. The subsequent section deals with the applications of explosion proof mobile devices spanning across different industry verticals including Oil & Gas, Mining, Pharmaceutical, Chemicals, Manufacturing, Energy and Others comprising of niche sectors. The aforementioned industry verticals have been examined in various regions across globe. 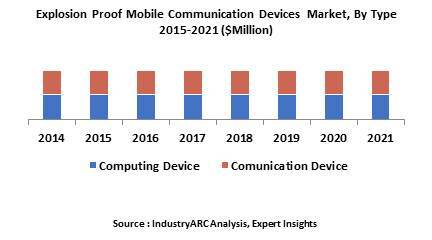 This study provides the market ecosystem existing for different categories of explosion proof mobile devices in regions encompassing Americas, Europe, Asia-Pacific (APAC) and Rest of the World (RoW). All these regions consist of eminent nations that have been comprehended based on their industries contributing saliently to respective GDP’s and applicability of explosion proof mobile devices in such industrial environments.